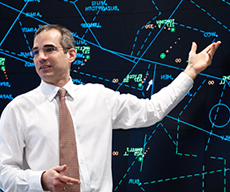 NATS Training offers full lifecycle training for air traffic controllers. Our expertise in Initial and High Intensity Operations prepares controllers for working in some of the most demanding operational environments in the world. NATS provides initial training in both theoretical air traffic management subject and practical simulator based training. Our courses benefit from the support network of a world class air navigation service provider, including access to our En-route Centres and airports such as Heathrow. Our instructors are experienced controllers, many of whom remain operationally valid. Our courses are supported by an industry-leading Human Factors department. NATS provides initial training in both theoretical air traffic management subject and practical simulator based training. Our European courses comply with the EUROCONTROL Specification for Common Core Content Initial Training. However, the complex demands of the air traffic management environment have been considered at every level in the design of our courses. All of our ICAO training follows Standards and Recommended Practices. Our off-the-shelf courses cover all air traffic control disciplines, and are designed to achieve a balance between theoretical and practical training utilising fictitious airspace. On completion of these courses, the students will have achieved the standard to enable them to commence on the job training at an Operational Unit. We deliver initial training from a leading-edge facility in the South of England, but our courses can be delivered anywhere in the world using our mobile simulator solutions. NATS operates in some of the world’s busiest airspace and airports, and by sharing this expertise we prepare air traffic controllers to cope with increasing traffic in their home markets. Our training equips controllers with the essential skills and experience to prepare for the future growth of air travel. Derived from our unique experience managing the busiest dual and single runway airports in the world, NATS offers specialised high-intensity runway operations training to upskill controllers and enhance the efficiency of their operations. For airfields anticipating traffic growth, this training can unlock capacity without investing in new infrastructure. NATS Training offers high quality developmental courses which augment the existing knowledge and skills of valid controllers. Contact us at training@nats.co.uk to discuss how we can help you meet your training requirements. Engineering Training Training solutions to suit any customer. Simulation and Input NATS training creates complex and operationally realistic exercises. Human Factors The ‘Human Factor’ is crucial to the safe and efficient operation of any complex safety-critical system. Contact us for more information at training@nats.co.uk.